In 1970, writer Dennis O’Neil and artist Neal Adams began collaborating on a series of hard-hitting Green Lantern and Green Arrow team-up stories for DC Comics, ushering in the era of “social relevance” for superheroes. In the years that followed, mainstream comics creators addressed war, drugs, ecology, and the generation gap, and popularized the idea that artists could do mature work in the medium without getting tagged as “underground” and being consigned to head shops. But they also began to face a dilemma that many of them never satisfactorily resolved: Was their goal to make kids’ entertainment more sophisticated, or to retrofit juvenilia into something that would captivate adults? That wasn’t just a question for people working in the comics industry. Just as Marvel and DC were being challenged by the likes of Zap and The Fabulous Furry Freak Brothers, the big American animation studios were aware of Ralph Bakshi and the Hubleys, as well as with what was going on in comic books and comic strips (where Doonesbury had recently become a sensation). Even venerable kiddie cartoon factory Hanna-Barbera tried to keep up with the times. In 1972, the company produced the syndicated primetime sitcom Wait Till Your Father Gets Home, which was meant to be an animated All In The Family. In 1973 it launched the Saturday morning superhero show Super Friends, in which DC icons like Batman, Superman, and Wonder Woman teamed up to stop villains from wrecking the environment. Then in 1974, Hanna-Barbera took its biggest swing at making more adult-friendly kids shows with two new Saturday series, neither of which survived past one season. These Are The Days was a Waltons-inspired half-hour drama, about an eccentric family in an early 20th century American small town. And Devlin—recently released on DVD by Warner Bros.—was another serious-minded half-hour cartoon, equally inspired by the “wandering hero” TV genre and real-life celebrity stunt performer Evel Knievel. Television doesn’t get much more “1974” than Devlin. The opening credits are a swirling, trippy riot of clashing earth tones, suggesting intense danger and action that the actual show rarely offers. The visual style of Devlin’s 16 episodes is instead fairly static, with a few touches to set it apart from the likes of Scooby Doo. During the many scenes of people riding motorcycles, the backgrounds are often abstracted, letting a few splashes of paint stand for trees and scenery. Onlookers and spectators, meanwhile, are frequently shown from extreme low angles, making them look like figures from propaganda posters. The result is an odd mix of abstract expressionism and utter mundanity. Ultimately, the mundanity wins out. Even the show’s lead is mellow to a fault. Michael Bell voices Ernie Devlin, a stunt biker who’s the star attraction of a circus run by crusty-but-honorable Hank McSummers (voiced by reliably growly character actor Norman Alden). In a typical episode, Ernie rolls into a new town and meets somebody in crisis, whom he then helps out with a combination of quietly sage advice and badass jumps and loop-de-loops. Devlin’s assisted by his younger brother Tod, a master mechanic (voiced by comedian/musician/Monkee Micky Dolenz), and his adolescent sister Sandy (Michelle Robinson). The family’s still reeling from the recent death of their father—a motorcycle cop—throughout Devlin’s sole season, which is why Ernie tends to fill the role of the calm, wise one. All of this thoughtful guidance and earnest sibling support would be fine if Devlin was just a family show: like a pen-and-ink Eight Is Enough. 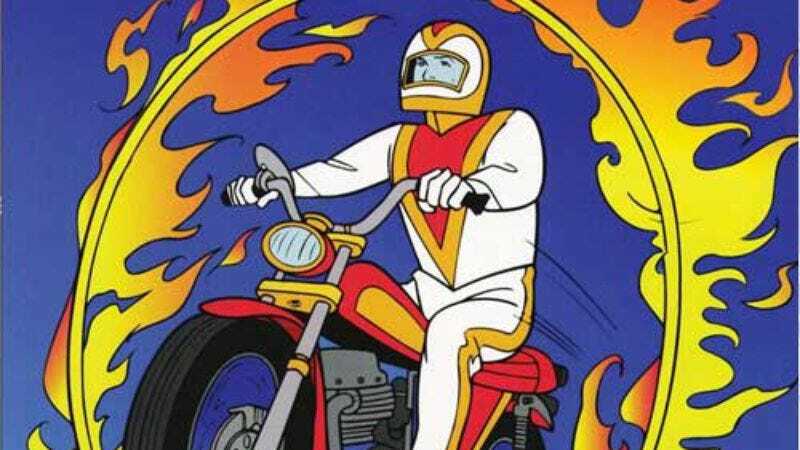 But it’s also a cartoon about a guy in a cool jumpsuit, riding a motorcycle through flaming hoops. It was essentially pitched as Evel Knievel: The Animated Adventures—and Knievel wasn’t exactly known for being good-hearted and level-headed. There was a certain vital craziness missing from Devlin. And yet, compared to most of the Hanna-Barbera comedies of the era—especially the unwatchable Wait Till Your Father Gets Home—Devlin is weirdly compelling. Nostalgia plays a role in that, to be sure. Anyone who grew up in the ’70s recalls Evel Knievel mania, which spawned toys, lunch-boxes, a major motion picture (starring George Hamilton! ), and the pilot episode for an ongoing live-action series (starring Sam Elliott!) Here then was another attempt to capitalize on a national phenomenon. The lack of dynamism in Devlin was partly the fault of Hanna-Barbera’s writers, for trying to produce something socially responsible. But the show’s real weakness was that death-defying motorcycle jumps just couldn’t be as thrilling when rendered in limited animation. Devlin’s also fascinating as an unusual hybrid of genres and forms. There’s a purposeful lack of exaggeration in much of the show, from Ernie’s bland face to the relaxed, harmonica-heavy country-rock soundtrack. The scripts are also freakishly focused on motorcycle maintenance, with whole long interludes dedicated to faulty carburetors and spark-plugs and the like. Because Devlin’s set at a circus, sometimes the writers break up the somber atmosphere by having a friendly elephant spray the characters with water, provoking forced jollity. But the for the most part, the reach for realism is so strong that this series barely counts as a cartoon. Still, Devlin holds up reasonably well because its stories aren’t bad. The 16 half-hours feature some tried-and-true TV plots—such as one episode where the circus’ best clown wants to pretend to be the owner so that he can impress his daughter—but also some that are specific to the times, and to Ernie Devlin and his siblings’ vagabond life. In “Up Up And Away,” Tod battles with a safety inspector who doesn’t believe that the Devlin team’s daring stunts are structurally sound, despite Ernie’s assistance that they “check our figures with computers.” In “Stowaway,” the circus stops at a border town, where the Devlins encourage Hank to hire an illegal immigrant. In “Sandy’s Idol,” the circus adds a hot young musical act—a bubblegum pop star incongruously named “Lucifer”—who then proves so insufferable that Hank has to question whether the crowds he draws are worth it. “Sandy’s Idol” ends with Lucifer getting fired, then apologizing and getting re-hired. Throughout the crisis—which includes Sandy losing faith in one of her musical heroes—Ernie says out of the fray, certain that his sister, his boss, and even Lucifer will be come around to the right way of thinking. Ernie Devlin’s a curious hero for a Saturday morning cartoon. He nudges gently rather than racing into action. Again, this is heady stuff for Saturday mornings—and maybe too much so, given that Devlin was quickly hastened off the air. But who was to blame: the Hanna-Barbera creative team for not serving their younger audience, or older fans of comic books and animation for not rallying behind something ambitious? Frankly, it’s hard to fault the latter. Even for those who were ahead of the times in 1974 and believed that this kind of entertainment could escape the “for kids” tag knew that Devlin was nowhere near as satisfying as an R. Crumb comic or the movie Fantastic Planet—and nowhere near as inspired as a Looney Tunes short or a Carl Barks Donald Duck story, for that matter. This was the lesson that superhero cartoonists and studio animators hadn’t really grasped yet in the mid-’70s (and perhaps still haven’t): that “sophistication” in an otherwise family-friendly product doesn’t just mean making everything darker and glummer. But however misjudged Devlin may have been, it was at least a move toward quality, and away from pumping out mindless product. The real revelation that many comic book creators and animators had in the ’70s was that since no one in the mainstream media took them seriously, they were free to experiment, and to make a conscious, affirmative choice for creativity. Even when they couldn’t pull off the stunt, it was a thrill to see them try. Purchasing Devlin via Amazon helps support The A.V. Club.